Use 10% off coupon: 'WOW10' at checkout. The right costume is important for Halloween. Details for Plug and Socket Adult Couples costume for Halloween 2019: Watch people roll on the floor with laughter when you enter in this plug and socket adult couples Halloween costume. 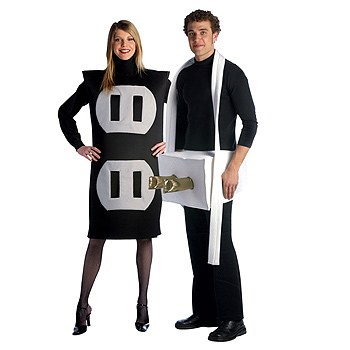 Get this plug and socket adult Couples Halloween costume before they are sold out. This couples adult plug and socket Halloween costume includes: Black and Gray socket Halloween costume AND White plug Hallloween costume with cord. These Halloween costumes are made of a lightweight durable fabric over Denur foam. Plug will fit into socket Halloween costume! Sure to be a hit at any party! One size (medium/large) fits most adults. Socket Costume is a Black tunic with gray sockets on the front. Bottom socket has flap openings for prongs from plug Halloween costume to fit into. This Plug and Socket Adult Couples costume is a highly recommended 2019 Halloween costume idea!